I know quoting myself is a goofy thing to do but I've been staring at the image and the math for hours and wondering how it can possibly be so ridiculously flawed. Have you ever tried measuring the width of an 8 inch diameter tree with a steel tape measure? It's not as easy as you think. The easiest way to do this accurately is to cut the tree down and measure across the top. 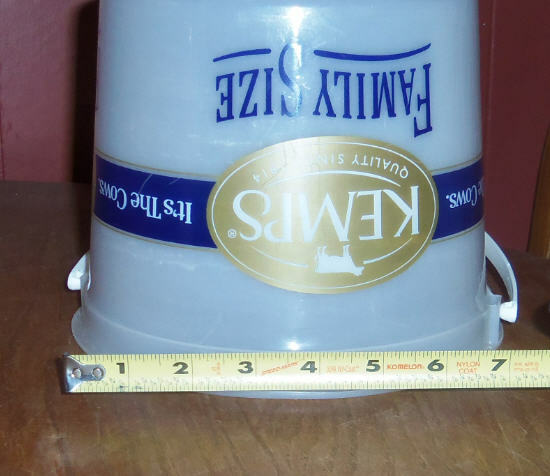 My ice cream bucket is 8 inches across. 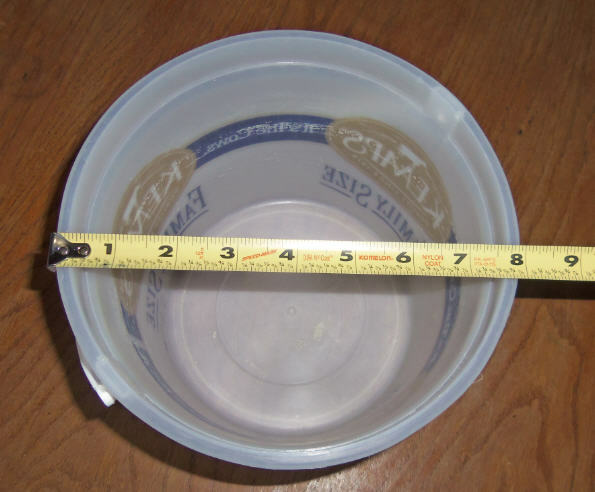 If I measure the same bucket by holding the tape measure in front of it, I get a vastly different reading. I read 7 inches across. The closer my eyes get to the tape, the narrower my bucket seems, according to the tape. That means my reading from the side should be 8/7 or 1.14 times greater than measured. Making the leap (to assume JG had this same problem) we can multiply our previous results by 1.14. With TC1 being 'measured' as an 8 inch tree, I calculated her height at 67 inches. If the 8" measurement should really have 1.14 times bigger, the tree is really 9.12 inches. I posted elsewhere in this thread that I have believed for a long time that Patty is about 6' 3". I don't have a 12" bucket to repeat the test for TC4, but I think the results will be similar. Very good finding, Redbone. That does look like a very likely source of error, in John's measurements. Just a couple pics ta add ta the equation. I don't understand what you wrote (in the highlighted text), hiflier. Can you elaborate on it, a bit? Note on shadows: A shadow cast by a certain object's width onto another object which is viewed from an angle will be viewed as being narrower than the object casting the shadow. That is exactly what I said, in my post. In the case of Patty....the tree's shadow (on her back) appears foreshortened...but so does Patty's back. Patty's back and the shadow both appear foreshortened to the exact same degree. The only true width of a shadow is when it is seen head on. The greater the 'angle of view' the thinner the shadow. To be more precise, hiflier....the only true apparent width of a shadow is when it is seen head on. The greater the 'angle of view' the thinner the shadow appears. Ok.....so now we got a 6’6” man walking around in there next to them darn trees. Do them trees look like they are the width of a gol darn ice cream bucket now!!? 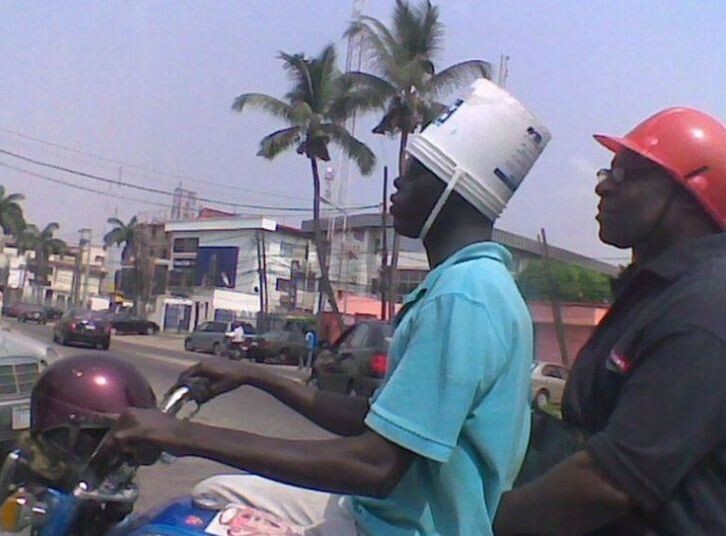 Imagine wearin the ice cream bucket like a hat on yer head. Depending on yer adult noggin it might fit or it might not. We painted em and cut em and used em as helmets as kids. They fit fine. Now look at the 6’6” mans noggin next to those trees. Which is damn side bigger? His head? Or the dang tree!?? I have cut and split cord wood all my life. And I will eat my shorts if the two trees in question are 8 inches! Maybe I'm being simplistic here, and if so please enlighten me. I have a copy of one of Bob Titmus' cast of Patty's right foot purchased from Jeff Meldrum at the Big Sky Bigfoot Conference in Hamilton, Montana in September. Jeff told me it was made in the first week after the PGF was shot. It measures 15 inches from big toe to heel. Using frame 323 as a reference, I plugged it into my desktop publisher and drew a red line from end to end. Using copy/paste, the line was duplicated and adjusted vertically and again copied and pasted end to end, alternating red and green, from crown to part way down the left shin. The left foot is not visible in the photo, but there must be at least 8 inches below the bottom of the last line. The line is reproduced 5 times for a total of 75 inches, or 6 feet 3 inches, plus the extra inches to the end of the left leg, even in the hunched posture. There is certainly going to be some error of perspective depending on how close to vertical her right foot is in the frame, however any such error would actually make the final height greater. 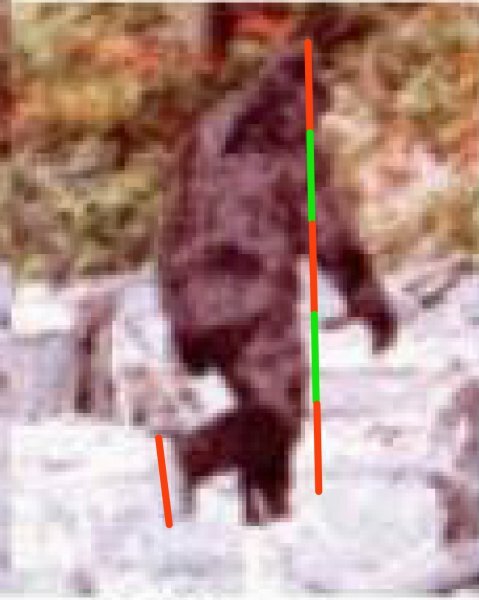 If my estimate of an additional 8 inches of length on the left leg is used, this would put her height in normal posture at 6 feet 11 inches. Comments? Guys, all this talk about the difficulty measuring trees has a very simple remedy and is a lot more accurate. Take your flexible tape measure and wrap it around the tree, pull it tight and simply divide it by three. If you must be more accurate use 3.14 to divide by. Looking at it from a different perspective which doesn't have any problem with perspective. Who knows, you may have to measure those trees the next bigfoot you see walks through. Measuring circumference is how a forester would do it. John Green was not a forester, and the data is 50 years old. And unfortunately his notes are a mess as well. John Green obviously was not a engineer and didn’t own a draft table either. We cannot drive back through time to the film site and re measure. We are lucky to have him and has secondary film though. Not many people drive 3 states away to document a Bigfoot sighting. I do not want people to think I’m bashing Johns efforts. We are amateurs and we do the best we can. The PGF is so convoluted though, look at this thread. Patty has been ranged anywhere from 5 feet to 7.5 feet. And people wanna invest in more camera gear to break the mystery? If only Bob Gimlin had pulled the trigger? We would not be having this discussion today. For me? It’s a Cinderella story. Patty does not look like Frodo Baggins in the film. Her body matches her feet. And yet her feet rival Shaq’s Feet in length and are even wider. That should give people pause who advocate a “short Sasquatch” hypothesis. TC1, TC2, and TC4 'appear' to be about the same size on the film but that's because TC4 is further back by between 50-60 feet. Since TC4 is a known width then 1 ft. divided by 162 ft. yields 0.0061 which is the ratio in feet of 162-1. Taking the ratio to TC1 would be 0.0061 ft. x 105 ft. = 0.648 ft.. Getting 0.648 to inches: 0.648 ft. x 12 inches = 7.77 which is darned close to 8 inches for TC1. The same calculations for TC2 = 8.4 inches. It only works because the three trees are of apparent similar diameters. Reversing the process yields the same results assuming an 8 inch width for TC1. 8 in. divided by 1260 in. (105 ft.) = 0.00635. 0.00635 x 1944 = 12.344. Divide that by 12 inches to get back to feet and one gets around 1 ft. - 1 ft. 4 inches. What was said about the parallax errors due to reading a flat ruler on a round surface may mean the errors are compounded as the diameter of the tree gets wider. So a 12 inch tree (TC4) may have actually BEEN closer to 16 inches? If so then a different ratio would occur putting TC1 closer to 10 inches and TC2 closer to a foot in diameter. Therefore Patty would appear larger. Probably large enough for the 15 inch foot print. These calculations of course are subject to minor errors considering what we have to work with. Examples being the distances on John Green's paper shouldn't be in exact feet as recorded but rather rounded up or down by some inches either way. He probably figured that the distances to the trees were great enough that he didn't have to be all that exact. Either way I'm sure it puts Patty at least 6 feet in height. I need to ask again though, Is this referring to the bole heighths of a certain tree? Maybe TC4? I don't know how close McClarin is to TC1, but he sure looks closer to it than Patty was. This distance will matter a little. I carry a flexible tape in my backpack and now I know this is the way to measure a tree if needed. So far I have not needed to. Good work RB! I will once again bring up that John Green rounded off to feet so an inch to an inch and a half difference either way could have been his MO. Your calculations and mine are about an inch or an inch and a half different. Yours are more than likely more precise. In the larger picture though it still puts Patty in over 6 ft. tall and we need to remember that's in a somewhat NOT straight vertical posture because of forward hunching along with her compliant gait. No way she is less than that. I think your off on your shoulder width. It’s called the “Bideltoid width” in the USMC. And the average is 19.41 inches. With the widest being almost 22 inches. I would guess a man 6 foot 6 inches is at the upper end of that scale. And certainly not under the average. I took that doodling to be some approximation of Jim’s height based off the circumference taper of the bole of some tree. Yeah, I've been studying it for a while to see if it matches up with TC1, 2, or 4. I've also been turning over the thought of just when John Green drew this up and whether or not it was when Jim McClarin was there or before as in when he first was on the scene to look t the trackway. I would thing the general tree positions drawing and the tree bole measurements were drawn at the same time/same day? If someone could help nail that down as well as determine which tree is being referenced it would be much appreciated. 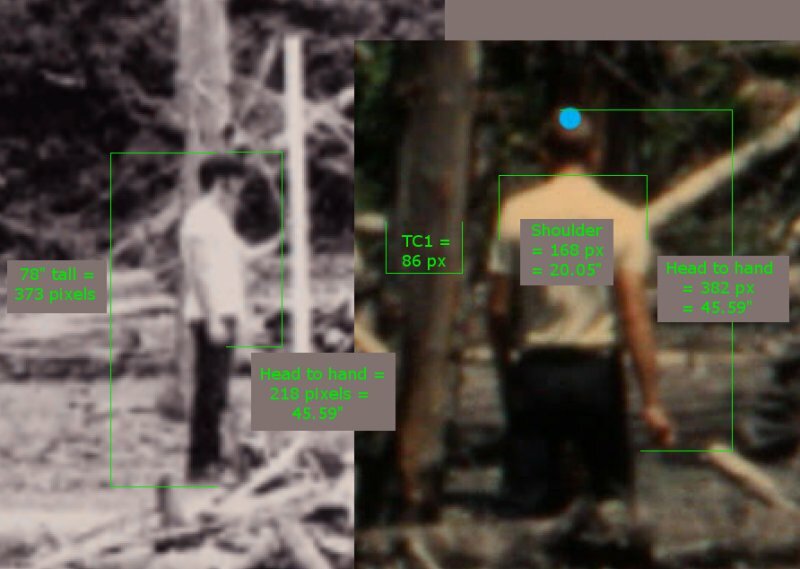 Since the sketch is more located near TC4 on the paper I've been assuming that it's the tree in question although the configuration of the boles looks more like the second tree next to Patty in PBeaton and your posts with the Patty/McClarin Photos? Only it appears that John Green drew the sketch from a different angle in relation to the tree. My point being the height measurement of 6 ft. 8 in. as it may have additional bearing on the Patty height issue when plugged into the other calculations we've been making. Let's measure McClarin... you say he is 6'6" or 78"
I needed something measurable in both images so I used the top of his head to the bottom of his hand. TC1(adjusted) = 10.26" x 105/115 = 9.36" with potential error if McC estimated distance is wrong.